Hey everyone, just a quick note that I am currently organizing a Tweetup for people in and around Düsseldorf. A tweetup is a casual Twitter meetup that will give you the chance to meet your followers and fellow Twitterers in your area. Curious not-yet-Twitterers are also very welcome to join us! 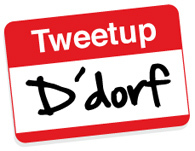 The Düsseldorf Tweetup will be held on 27th February, starting at 19:00 at Barco. You can sign up on the event network to let us know you’re coming (please also remember to sign up for the event itself additionally), and follow @ddtu on Twitter (German language) for the latest information. I’m really looking forward to the Tweetup and I hope to meet you there! You are currently browsing the position: absolute weblog archives for February, 2009.